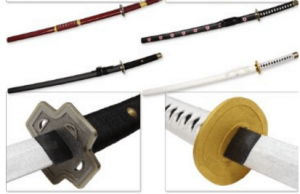 Lets continue our series of cosplay tips and guides, with a post on how to cosplay Roronoa Zoro, our favorite One Piece swordsman. The unofficial vice captain of the Straw Hats and a member of the so called Monster Trio, along with Luffy and Sanji. The former bounty hunter serves as one of the best picks for a One Piece cosplay. His green hair, along with his three swords, would make everyone who cosplays him totally badass. To form a good basis for our cosplay we should start with the main part of the costume. That is Zoro’s clothes of course. If someone wanted to do the cosplay on their own, the idea is pretty simple. All you need is a white t-shirt with neck buttons to leave undone, black pants tucked inside his pair of boots, some green type of scarf or something to wrap around your waist to resemble his haramaki(he keeps his swords in it) and a similar, albeit smaller one, to wrap around your hand(the left one :P) in the place of the bandana he uses(the one he wears on his head when things are about to get ugly :D). With those you’re pretty much set. However, if i had to go with a costume, i would choose the one by Dazcos. They make high quality costumes. Just be careful on the size you choose. Look at their reference numbers just to be safe ;). After the timeskip Zoro is seen with a long green type of kimono/cloak. The green haramaki is again shown inside his coat. He now keeps his swords in a red sash that is wrapped around his waist above his coat. The black-green bandana is still there in his left forearm. For a costume choice, i would definitely go with the one from Cosplaydaddy. The quality is really unparalleled and i didn’t tell you the best part. 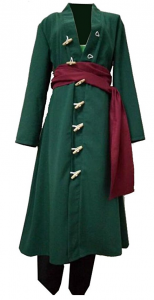 Under the green coat, there is basically the pre timeskip outfit of Zoro. So, this one makes it possible to do two cosplays with the same one costume. Definitely recommended! Lets suppose you want to distinguish yourself from the masses. Your friends are cosplaying Zoro the conventional way, or you just don’t wanna wear such a mainstream costume. 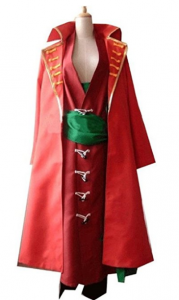 Well, there is a really interesting alternative, with this red Zoro costume. The costume from the film One Piece Z will certainly do the job. It’s quite badass if you want my opinion. The most notable feature of Roronoa is his green short hair. His hair is the reason Sanji teases him in their hilarious fights, calling him a marimo, which means a mosshead. You should just be careful whether you choose to cosplay pre or post timeskip Zoro. If you choose the latter, be sure to include the distinguishing scar in his left closed eye. Check our theory on this one here, if you haven’t already. For the cosplay now. My choice for Zoro’s hair would be a simple green wig. The one i recommend is the wig from Cosplaza. 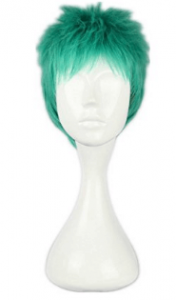 It is 30cm long and it also comes with a free wig cap to put it on. For washing it, just be sure to follow the instructions of the amazon product description. 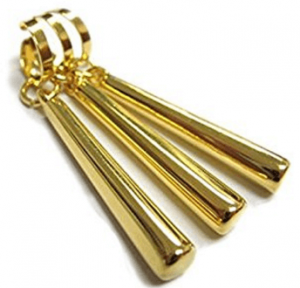 It’s made of high quality material and at a reasonable price will certainly do the job. Another notable feature of a Roronoa Zoro cosplay are his earrings. Just pick a fancy piece like the ones from becute that we recommend. As far as the eye scar is concerned, you have two options. The first one is really simple and utilises the really handy fake scars by Dealglad. They are really cheap and can be used for a variety of cosplays, costumes and Halloween partys. For a more elaborate make up tutorial that covers everything you need for the Zoro cosplay check the following video. I have no affiliation with the video uploader, it’s just an awesome tutorial that i thought would prove really helpful. 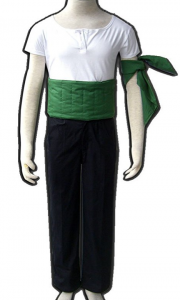 It can also be done by girls who wanna cosplay Zoro and want to be as realistic as possible. Be sure to check it out. Should you need coloured contact lenses for the cosplay, be sure to check out Eyecandys. They have a huge variety of colours, their lenses are perfect for your eyes and their prices are hard to beat. Choose a nice green pair to get your cosplay to the next level. In order to complete our cosplay, we should certainly choose a pair of quality boots. 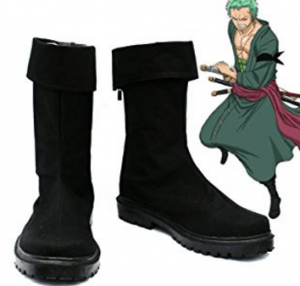 Zoro tucks his trousers inside his boots, so be sure to do that. The boots i recommend from Telacos are from high quality leather. Just be sure to choose the appropriate size when adding to your cart. Of course, any pair of black high heeled leather boots will do the job. 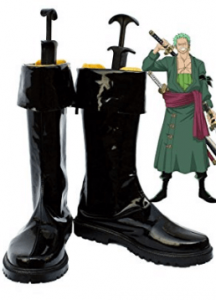 There is also an alternative choice from Telacos, that looks more like the boots Zoro had pre timeskip. Be sure to check those out as well. Lets finish this one, with one(well actually three :P) of the most important components of Zoro’s cosplay, his swords. He has been seen carrying a set of three swords along the way. Of those three, the Wado Ichimonji has always been with him, while the other two have varied, due to the fact that they were destroyed and replaced with better ones he found along the journey. The best choice by far is the four piece katana set by the Bukong Cutlery. 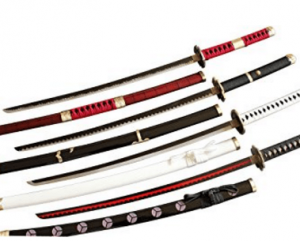 They are unbelievable swords that you can also have as decorations at your house, especially if you are a collector. They are pricey though, so lets look at some alternatives. A set of wooden replicas, that is cheaper and safer than the last ones, is the one from Swordsaxe. Nice choice also. 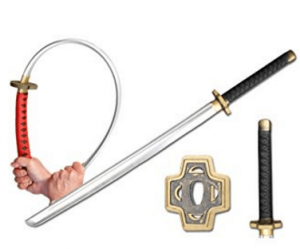 For the cheapest set just get some foam swords like the following and put them quietly in your haramaki :P.
For more on one piece cosplay swords and replicas check our comprehensive review with suggestions here. To be Zoro you can’t just simply dress like him. You must also behave like him. Be aloof, lose your sense of direction all the time and be bold. Care about sleeping, eating, training and drinking booze, as long as your friends are safe of course ;). Check this guide for similar tips. That was our guide today on how to cosplay Roronoa Zoro from One Piece. Did you like our suggestions? Leave your feedback below. Zoro + cosplay interesting subject. What i find interesting is all of the different parts of the costumes you have included in your page. It’s very colourful and makes me want to read more about other possible caracters that can be cosplayed. Try to use more colors on your subheadings and different heading sizes. Keep up the good work! Happy you liked the subject Dan! I’m glad that the piece by piece format of the guide was actually well received. I will bring more variety to my subheadings and headings. 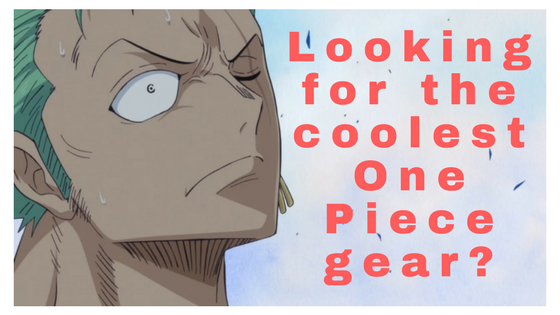 Be sure to join our newsletter in the sidebar and like our facebook page for our most recent guides and theories about One Piece. Cheers mate! Thanks my friend! Glad you found the tutorial helpful! 🙂 Check more of them here! He may be using them to stabilize the swords, though I’m not sure, haven’t noticed them really! Previous Previous post: One Piece Cyborg Franky – How powerful is he after the time skip? 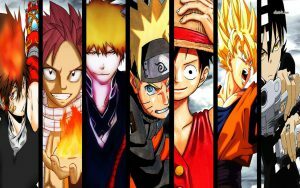 Next Next post: Who is the Strongest Hokage?